Since the early 1990’s, this annual workshop has played a vital role in nurturing interactions among the various UF laboratories, students, post-doctoral associates, faculty and staff by giving students and early career scientists an opportunity to sharpen their presentation abilities. 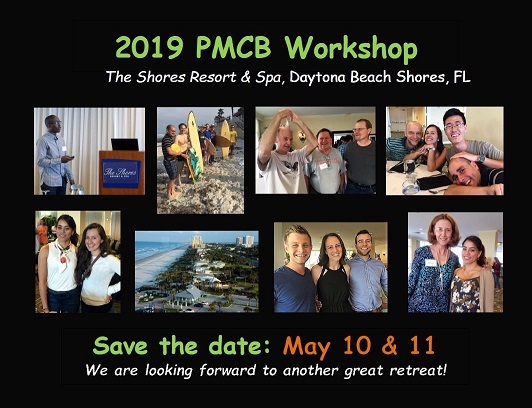 Our 2019 workshop will once again held at the gorgeous beach front hotel The Shores Resort & Spa in Daytona Beach Shores, FL. As always, we expect very strong attendance by faculty, graduate students and post-doctoral research assistants from UF and other institutions. Thank you for helping us celebrate PMCB's past, present and future! Afternoon presentations until 4:30 p.m.
Dinner at 7:00 p.m. and party after 9:00 p.m. Morning presentations and awards, adjourning at 11:45 a.m.
Download 2019 Registration Form for rates and instructions on how to register. The PMCB group rate is $134 (25 rooms are blocked for Thursday, 34 rooms for Friday). Rates are based on single/double occupancy and there is an extra person fee of $20 for 3rd and 4th persons, per room per night. Please make your reservation directly with the hotel. You may call the toll-free number (866) 934-7467 OR make your reservation online by clicking HERE. If calling, mention that you are with the University of Florida PMCB Program to guarantee the PMCB group rate of $134. If booking online, just enter the arrival and departure date and then click availability to see what rooms are available to the group. The group rate and rooms may not be available after April 10. To place a reservation you will be asked to provide complete name, home or business address, email address, type of bed (i.e. king, double/double), check in and check out dates and credit card information. The hotel will also require a deposit equal to the room rate and tax for the first night for each reservation. Each guest (including double-occupancy reservations) will be required to present a valid credit card upon check-in. Guests are responsible for settling their own account in full upon departure. The hotel is about 100 miles from Gainesville (approximately 2 1/2 hours). Click here for a map and directions if leaving from Gainesville. Click here if arriving from nearby airports (Orlando, Jacksonville, Daytona). Include the title, presenter’s name, affiliation and authors. Follow the format displayed in these examples. LIMIT ABSTRACTS TO 200 WORDS. Abstracts in excess will be edited and may not convey all the information intended. Please send complete abstracts to Eliana Kampf (elianak@ufl.edu) by April 11. Three awards will be given for best student presentations. Awards are designed to help students with travel expenses to conferences and educational events. This competition is open to all students regardless of affiliation.